This herbal drink is making me feel detoxed and vulgar all at the same time. Just FYI, guys, FYI. According to Wikipedia, Prunella vulgaris, also known as common selfheal, heal-all, heart-of-the-earth or hạ khô thảo in Vietnamese, is a medicinal plant in the genus Prunella. Heal-all is both edible and medicinal. It can be used in salads, soups, stews, or boiled as a pot herb. It has been used as an alternative medicine for centuries on just about every continent in the world, and for just about every ailment. Heal-All is something of a panacea, it does seem to have some medicinal uses that are constant. The plant’s most useful constituents are betulinic acid, D-camphor, delphinidin, hyperoside, manganese, oleanolic acid, rosmarinic acid, rutin, ursolic acid, and tannins. The whole plant is medicinal as alterative, antibacterial, antipyretic, antiseptic, antispasmodic, antiviral, astringent, carminative, diuretic, febrifuge, hypotensive, stomachic, styptic, tonic, vermifuge and vulnerary. 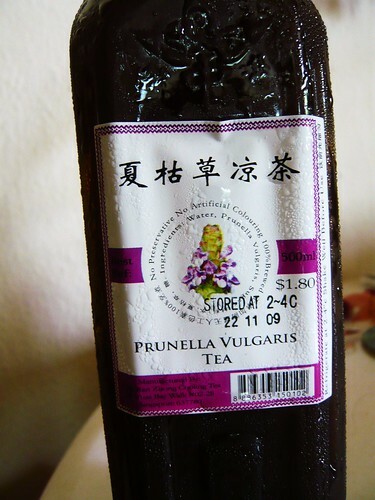 It is taken internally as a medicinal tea in the treatment of fevers, diarrhoea, sore mouth and throat, internal bleeding, and weaknesses of the liver and heart. Clinical analysis shows it to have an antibacterial action, inhibiting the growth of pseudomonas, Bacillus typhi, E. coli, Mycobacterium tuberculi, which supports its use as an alternative medicine internally and externally as an antibiotic and for hard to heal wounds and diseases. It is showing promise in research for cancer, AIDS, diabetes, and many other maladies. If you managed to finish reading the above, give yourself a pat on the back because I didn’t.